James' cheese soufflé makes an impressive brunch if you have friends over. Equipment and preparation: for this recipe you need four ramekins or soufflé dishes. For the soufflés, preheat the oven to 180C/160C Fan/Gas 4. Rub the inside of the ramekins with some butter, then dust with flour and place in a high-sided oven tray. Melt the butter in a large saucepan set over a medium heat, then add the flour and mix well. Cook over low heat for 2-3 minutes, stirring with a wooden spoon. 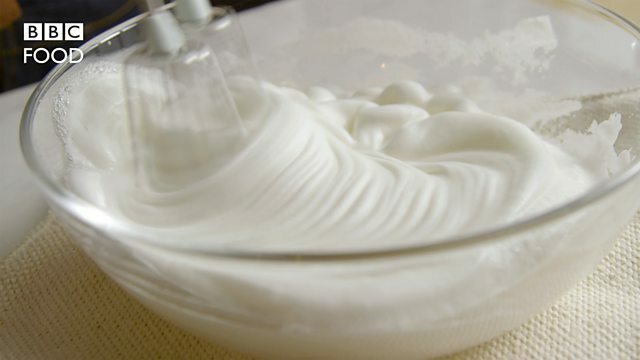 Gradually whisk in the milk, a little at a time, stirring constantly to avoid any lumps forming. Continue until all the milk has been used, then reduce the heat to very low and cook for a further 2-3 minutes. Add the cheese and mustard, then beat the egg yolks into the mixture and season with salt and black pepper. 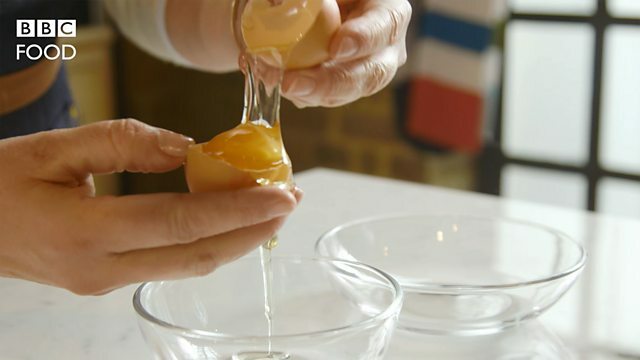 In a clean, dry bowl, whisk the egg whites until they hold firm peaks when the whisk is removed from the bowl, then fold them into the soufflé mixture. Divide the mixture among the soufflé dishes. Pour enough hot water into the oven tray to reach halfway up the sides of the dishes. Bake the soufflés for 15-20 minutes, or until they are risen and evenly browned. Remove the dishes from the tin and set aside for a few minutes. 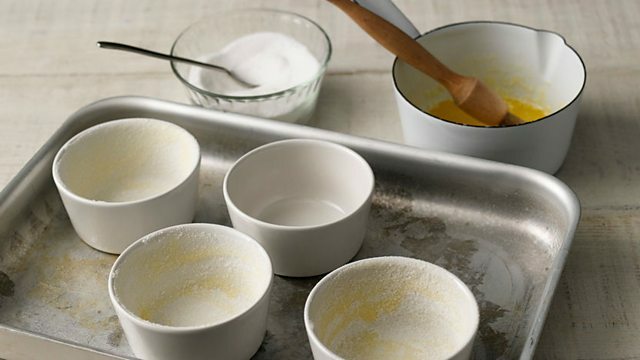 Run a knife around the edges of the soufflés and turn them out onto individual ovenproof dishes. For the glaze, preheat the grill to medium-high. Whisk the cream and kirsch until combined. Coat the tops of the soufflés with the cream, then scatter over the cheese and place under the grill until the tops are golden-brown. For the salad, put 110ml/3¾fl oz of water and the sugar in a saucepan and bring to a boil. Simmer until the sugar has dissolved and the syrup thickened slightly. Add the walnuts and cook for 2-3 minutes. Drain the walnuts on kitchen paper. Heat a deep fat fryer to 180C or pour enough vegetable oil into a large frying pan to cover the bottom by 2cm/¾in and heat until just shimmering. (CAUTION: hot oil can be dangerous. Do not leave unattended.) Carefully place the walnuts, a few at a time, into the hot oil for a couple of minutes, or until golden-brown. Remove using a slotted spoon and transfer to a plate lined with kitchen paper. Set aside to cool slightly. Put the dandelion leaves, rocket and chives in a bowl, then add a little dressing and toss to coat. To serve, pile the salad onto top of the soufflé and serve immediately.